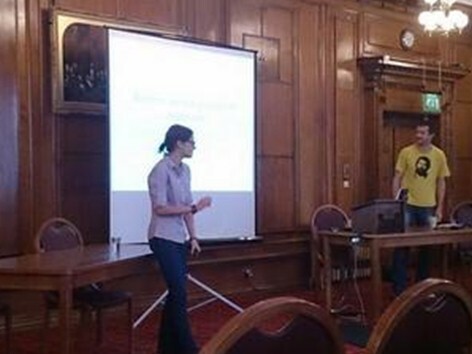 On the 16th October the Glamorgan Building played host to researchers from a variety of disciplines all pursuing research into Mental Health and Wellbeing. 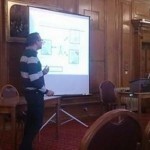 The event was distinctly international, with researchers from Rotterdam and Wroclaw presenting, alongside delegates present from Birmingham City University as well as various schools from within Cardiff University. The first half of the afternoon focused on the Imitation Game, firstly with a keynote talk from Harry Collins on its theoretical development and underpinnings, and then from Rik Wehrens (Rotterdam) and Kasia Kulwicka-Durnowicz (Wroclaw), who have both used the Imitation Game in their research. Rik has used the Imitation Game in his research into patients hospitalised with eating disorders. He has used ImGame techniques to understand the ways in which medical practitioners understand the lived experience of their patients, as well as to assess whether there is a common illness narrative amongst these patients. Rik hopes to use the Imitation Game, particularly the focus groups which follow it, as a therapeutic tool, bringing the understandings of both patients and medical practitioners closer together. 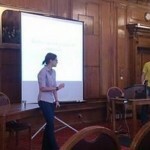 Kasia has used the Imitation Game in her research into sufferers of depression. Her research has focused particularly on the written accounts of women with depression produced during Imitation Game sessions. This has allowed her to gain unique insights into the ways in which these women relate to their condition, opening up further interesting lines of enquiry and the possibility of other therapeutic applications for the imitation game. The event was an interdisciplinary affair focusing on novel methods and as such the second half of the afternoon saw talks from researchers within other disciplines using different approaches in their research. 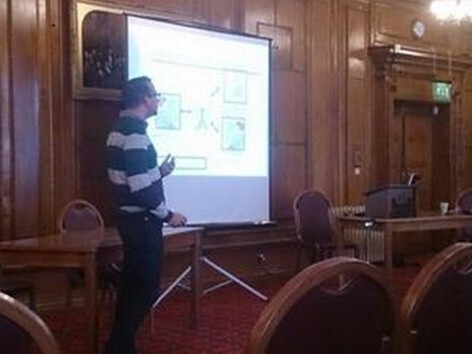 Ben Windsor-Shellard, from Cardiff’s School of Psychology, presented findings from his PhD research into implicit and explicit measures of sexual orientation and the implications for wellbeing when discrepancies between the two are detected. Also presenting was Mohammad Marie from Cardiff’s School of Health Sciences, who presented findings from his research into resiliency amongst community mental health nurses in Palestine. The day concluded with a round-table discussion focusing on the possibility of interdisciplinary research and the problems which have to be overcome in order to engage in it. One thing which became clear to all participants was the simple language barriers or clashes in terminology which need to be broken down or worked through before meaningful interdisciplinary work can be carried out. The day was deemed a success by the attendees, many of who joined the organising committee at the post-conference wine reception, where the wine was enjoyed not only for its quantity and price, but also its quality (thanks Martin! ).